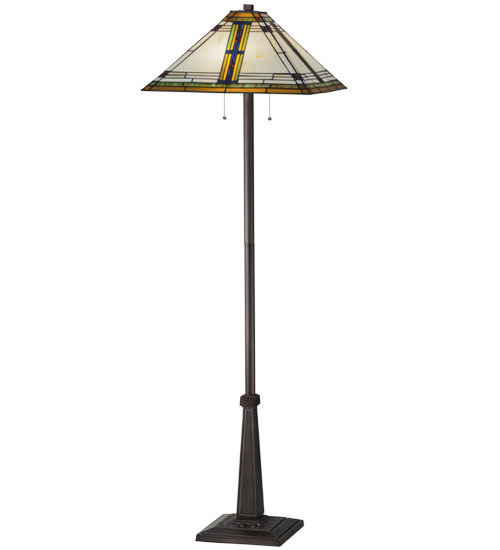 Description: This authentic Mission Craftsman floor lamp features a dramatic grid design of Green and Purple/Blue with Red. This shade was created with high quality art glass, which was copperfoiled and hand-set by Meyda's expert artisans. Vibrant Mission colors include a Cloudy Beige background and Honey Border with accents of Red and Purple/Blue. The shade is enhanced with a floor base finished in Mahogany Bronze.